Welcome to The Weekender, our weekly discovery of unexpected, active-luxe weekend destinations to recharge and not apologize for dietary restrictions. 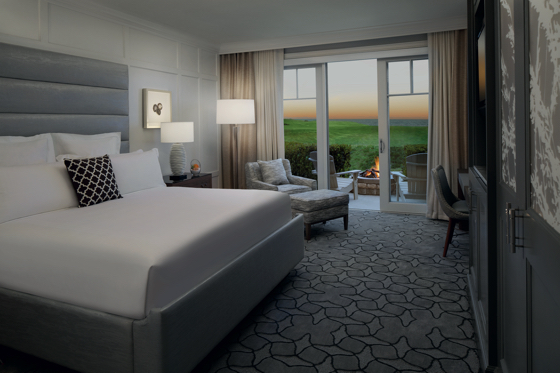 Ritz Carlton Half Moon Bay is home to all of the resort luxuries we never knew we needed: personal fire pits, a Crossfit instructor chef leading a fine dining restaurant and award winning tennis courts perched right above the ocean. Just 25 miles south of San Francisco International Airport, 30 miles south of San Francisco proper and 43 miles from Mineta San Jose International airport; Ritz Carlton Half Moon Bay is not much further than most people’s morning commutes. Book a Guest House Fire Pit Room, Check in on a Friday afternoon to settle in and watch the sunset over the water at the property’s Ocean Terrace. Grab your glass and head to the room for a moment of peace and quiet, fireside. 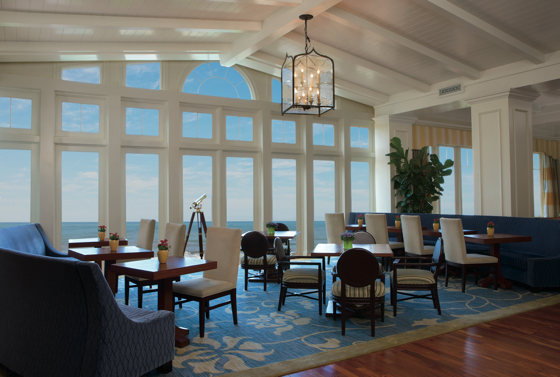 Throw on your resort casual best for dinner and head to The Conservatory, a gorgeous open dining room with floor-to-ceiling views of the water. Chef Dela Cruz prepares traditional California farm-to-table cuisine using community grown produce and, because he moonlights as a Crossfit instructor, is more than happy to whip up super clean off-menu dishes for the dietarily restricted. Dine on a tweaked version of menu items that depending on the season may include a vegan sauteed red quinoa pilaf with carrots, spinach and sunchokes topped with a wonderful spicy garlic aioli made super creamy by blending mixed tofu with roasted garlic. Naturally, the wine list is a perfectly curated selection of mostly Northern California wines. More surprisingly, many of the cocktails are made using live herbs grown on The Conservatory’s living wall, just one of many nature-luxe elements in the dining room. After dinner, walk back to the in-room fire pit/private patio for a little cocktail nightcap or a glass from Eno wine bar and nod off to total quiet. Open your eyes just enough to whip up a pot of in-room coffee, then perk up, suit up and head down to weekly Saturday morning Surfset class on the Ocean Lawn. Cooler weather moves class to the Observatory Room. After class, check out Navio’s breakfast spread whose plant-based options include a green smoothie, oatmeal and local fruits. Or head 10 minutes inland to the local Half Moon Bay farmers market. Grab some fresh as can be produce (this is an ag town, after all), and a few healthy treats, like vegan truffles. Head back to the resort for a running map, a set of complimentary bike rentals (book these in advance), or guide to local hikes recommended by the property. A short, scenic choice might be the Devil’s Slide Trail, which is 1.3 mile area of up and down Route 1 to breathe in the coastside air and get a peek at the local marine life. The hotel seems to have a solid monopoly on solidy health fare in town, but for an afternoon escape try lunch at Half Moon Brewing Company for a local vibe, but bring a protein if you’re plant-based, as vegan options are limited. Or try the newer Via Uno for the kale salad and wood-fired pizza. If it’s gorgeous outside, pop back to the property to rent complimentary rackets and tennis balls from the front desk and check out the six on-property tennis courts, reservations are included in the resort fee. To reward yourself for a match well-played, check into the resort’s spa for a bodywork session or the signature Tatcha Pearlescense facial. Take a steam, head back to the room and nap it out for a few. Don’t worry about getting ready for dinner - keep the robe on and order in-room dining from The Conservatory or Navio. Sleep in, read, then after checking out, try a walk down to Main street for a coffee like the locals do it. Head back to the airport or drive home about 1000% more rested than when you arrived. The property supplies complimentary bikes, tennis rackets and maps for running and hiking. If you're planning on dining off-property at all and happen to be vegan, bring some bars and/or protein powder as it’s tough to find vegan protein in town. It’s easier to be gluten-free here. Bring your best resort casual: long skirts, dark jeans, flats and sweaters for the oceanside chill at night.